Dimetrodon is often mistaken as a dinosaur, but actually went extinct around 40 million years before the first dinosaur appeared in the Triassic Period. Dimetrodon is actually a “mammal-like reptile” classified as a synapsid. One of the primary features that identifies “true dinosaurs” is the position of their legs. 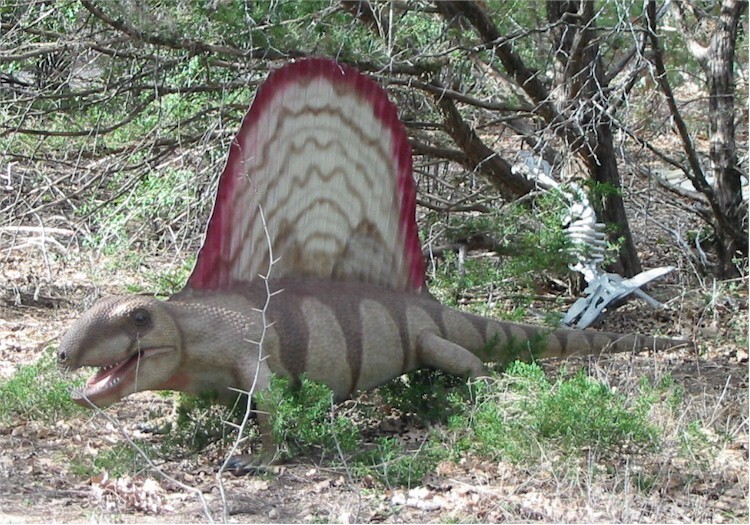 Notice how Dimetrodon’s legs sprawl out to the side of the body; this is quite different from how dinosaurs’ legs are extended vertically under their body. Dimetrodon was named for the varying sizes of large teeth in its mouth, instead of its most prominent feature, which is the large sail on its back. Some scientists believe the sail was used as a form of thermoregulation to heat or cool the body. Others believe it was more likely used as display for courtship. The size of the Dimetrodon varied throughout its existence. They were much larger in the Permian period, but their body size decreased by the Triassic period.